Birgit Schneider is professor of Media Ecology at the University of Potsdam. She worked as a graphic designer from 1998 to 2003 and was research associate in the project “Das Technische Bild” at Helmholtz-Zentrum für Kulturtechnik at Humboldt University from 2000 to 2007. There, she worked with Horst Bredekamp and Friedrich Kittler. Her dissertation “Textile Processing: A Media History of Punched-Card Weaving” presents a historiography of punched-card weaving as a mediatic precursor to digital computing. Since 2008, she has been Dilthey Fellow at the Fritz Thyssen Foundation at the Institute for Arts and Media, and in 2009 was a substitute professor for cultural techniques at the Bauhaus-Universität, Weimar. Her current research focuses on the visualisation of climate since 1800, and on a genealogy of climate change visualisation in between science, aesthetics and politics. BS: I did a lot of research on issues in climate visualisation, and how—from a visual perspective—climate is an entity between science and politics. I have been doing research on climate visualisation for many years now. BS: There are so many layers of technological systems operating on us. There are those that are more obvious—we might all tend to immediately say ‘the Internet,’ but it is only one system of many. We have the transport system, we have financial systems, we also have bureaucratic and security systems, television broadcast systems. I think of such structures as networks and these networks are all related to each other. BS: I wear textiles and I think this is already a part of the technosphere because textiles are some of the most technically-sophisticated objects humans have been producing for thousands of years. This morning I wore a headset, this is also a connection between the biosphere and the technosphere on my body. I have a very old-fashioned watch on. 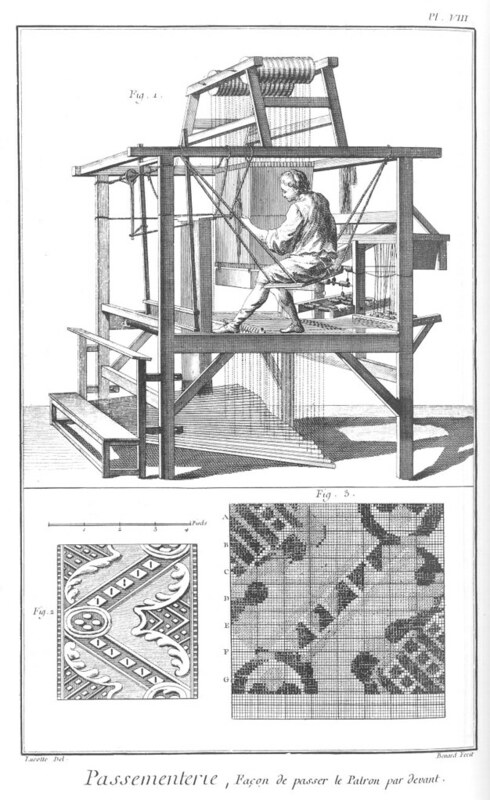 Treadle loom for ribbon weaving from Diderot’s Encyclopédie (Paris, 1751–1780). Denis Diderot and Jean-Baptiste le Rond d’Alembert, Recueil de planches, sur les sciences, les arts libéraux, et les arts méchaniques, avec leur explication, L’art de la soie (Paris, 1751–1780), “Passementerie”, plate vii. cc.cc: What part of the technosphere do you rely upon the most? BS: I very much rely on transport systems, mostly trains. I also rely on the city, as an infrastructure. I rely on the Internet, email and telephone, and media systems as well. 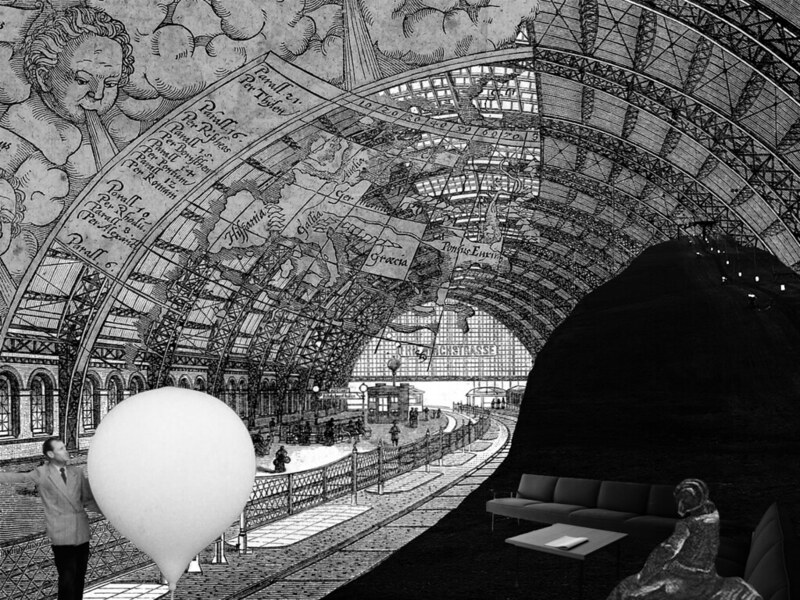 BS: I think about the technosphere, as a spatial object, maybe even an environment, a capsule, a dome, a body, a space. We are inside of this space—a space interwoven by many networks and wires, as well as wireless communication waves. It is a matrix; it gives order to things and how they communicate with each other, and how they get transported, and moved from one part of the world to the other. It is global. BS: The Welsh island with windmills. I like how it combines landscape and the technosphere. This is what is happening in our world at the moment: the energy system transforms the landscape, and these transformations become more and more obvious to our eyes. I was in the mountains—hiking—during the summer, and we ended up in a skiing region. To me, this was the saddest thing I had seen in a long time because there was the technology to bring up the people for skiing, and the melting glaciers—all at the same time—and the reservoirs of water to supply the snow cannons. It is all there, and very visible. Horst Bredekamp, Vera Dünkel, Birgit Schneider. The Technical Image. A History Of Styles In Scientific Imagery. (Chicago: University of Chicago Press, 2015). Birgit Schneider. Textiles Prozessieren. Eine Mediengeschichte der Lochkartenweberei. (Zürich-Berlin: Diaphanes, 2007). Birgit Schneider, Thomas Nocke. Image Politics of Climate Change. Visualizations, Imaginations, Documentations. (Bielefeld: Transcript Verlag, 2014). EDITORS’ NOTE: Schneider is referring here to her work on the history of textiles and its close relation to the digital principle: “The first images that were transferred from their physical forms to be processed as code were textiles. The code consisted of a set of punched cards to operate the mechanics of a weaving loom. It was still tangible: the image that was woven from these cards was a tactile, textile object”. Birgit Schneider. Textiles Prozessieren. Eine Mediengeschichte der Lochkartenweberei. (Zürich-Berlin: Diaphanes, 2007). C.f. William Gaddis, “[T]he whole digital machine, whole binary system that all-or-none paper roll with the holes in it running over the tracker bar that’s where all of it came from,” Agapē Agape. (New York: Viking, 2002) 8.